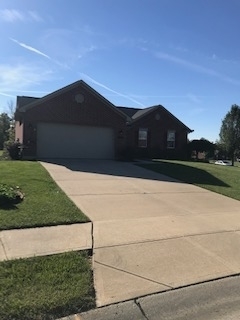 Fabulous Arlinghaus Brick Ranch, Pristine Condition!!! Catheral Ceiling Hardwood entry with closet, Family Room with Gas Fireplace leading to Kitchen with all appliances provided. Counter top and counter bar are Corian. Breakfast room with slider to patio. First Floor Laundry, Three bedrooms and two full baths complete the first floor. Lower Level is finished with Walk out and Wet Bar and refrigerator built in. Counter is also Corian. Large family room plus 3rd full bath with Corian Shower and Counter. Additional Storage room with shelving. All attention to detail has been met in this home.